End of a Cosmetic Sponge: This is the way we used to get ink on paper for backgrounds way back when. We stampers still do it some, but we’ve learned easier ways since then. Still, I thought the look of simply repeatedly pressing the sponge end to the paper (instead of trying to smear it smooth) had potential for a background pattern. Direct To Paper: DTP is a technique popularized the the ladies at Magenta many years ago using Clearsnap pigment inks and it is still a good one. You want a juicy inkpad so that it doesn’t drag on the cardstock too much and cause the inkpad come loose. Brayer: I used a soft rubber brayer here. It was the quickest of the techniques (except for using a stamp) and gave me a smooth bold result. 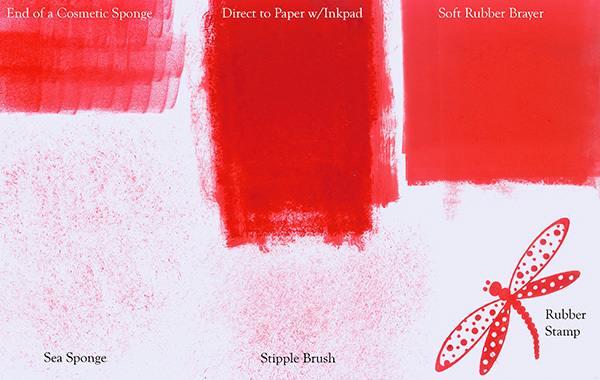 Sea Sponge: I tend to use sea sponges more with paint than with ink but sometimes when you want a more random speckling of ink, they can be an effective choice. Stipple Brush: This was done with a JudiKins Color Duster brush. It creates a more uniform speckling pattern. Stamp: The stamp is by Deadbeat Designs. 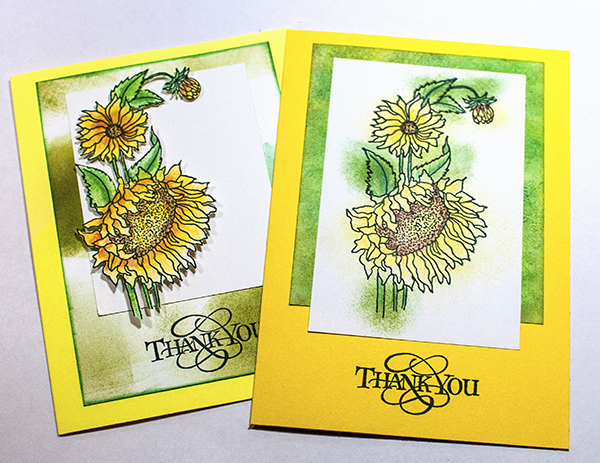 Stamping is of course my favorite way to get ink onto a piece of paper. What is yours?